GuitarControl.com released a new video guitar lesson from GuitarControl.com instructor Gaby Soule. In this guitar lesson, now available on YouTube.com, Gabe Soule teaches a shred lesson in the style of Paul Gilbert. Gaby Soule demonstrates this cool lead guitar lick in the style of Paul Gilbert in the key of C#m (C sharp minor) based in the pentatonic scale as follows. 11th fret of the 5th string with 3rd finger, then a pull-off to the 9th fret with first finger to the 12th fret of the 6th string with first finger. Then back to the 9th fret of the 5th string with first finger and a hammer-on to the 11th fret with 3rd finger. Soule continues this same sequence based on two strings at a time in the first position of the minor pentatonic scale ascending all the way to the end of the scale. 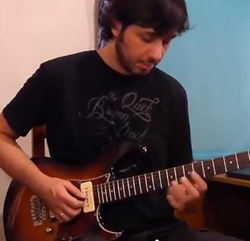 Gaby finishes off the lick with a descending C#m arpeggio that uses string skipping and legato. Guitar TAB’s are available for this lead guitar lesson at GuitarControl.com. Paul Gilbert is a virtuoso guitarist from Carbondale Illinois best known for being a member of Racer X and Mr. Big and has also released numerous solo albums and guest appearances on other albums. Gaby Soule is a guitarist, composer and singer originally from Argentina but has lived and worked in Spain as a musician and guitar instructor for many years. He has released several albums with his own projects and with other artists. He's been a member of many bands in Argentina and Spain. Gaby has worked with other groups touring Europe and South America, and played with bassist Rudy Sarzo (Whitesnake, Ozzy Osbourne, and Dio), Walter Giardino (Rata Blanca), La Renga and other artists like Andres Calamaro. He combines his activity as a guitar instructor in Madrid, Spain, as well as being an online guitar teacher. Gaby is currently writing new material for his upcoming project.